Lights have always needed to be turned on and off manually, but now the Apple HomeKit has made it easy to operate your house’s lights with your iPhone or iPad. 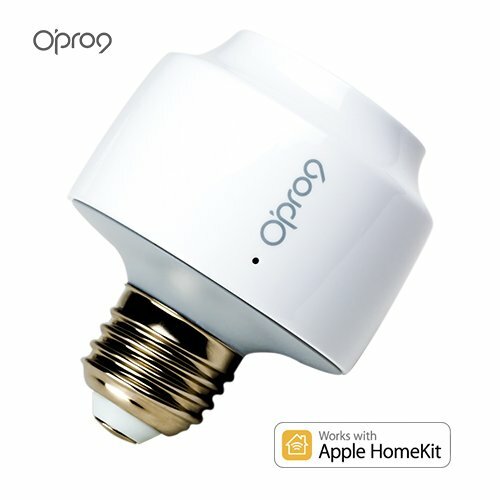 The Opro9 iU9 Smart Lightbulb Socket is compatible with the Apple HomeKit, so you can control, monitor and schedule your lights remotely and with your voice. As long as you’re at home connected to your WiFi, or remotely connected to your Apple TV or iPad acting as a router, you can control your lights. You can finally experience what it’s like to live in a “smart” home. Remote Control From Anywhere - You can turn your lights on and off remotely through your Apple iPhone/iPad. Dim your lights at the brightness you want - Create a certain atmosphere with your lights by dimming them with the Smart Lightbulb Socket feature. This is suitable on various occasions, for example when you want to watch TV with the brightness of the lights turned down. Control lights with your voice - Giving commands through Siri allows you to easily control your Smart Lightbulb Socket with your voice. Create customised schedules - Control the times when your Smart Lightbulb needs to be turned on or off or dimmed, based on your own daily routine. Set up favourite scenes - You can create custom settings like "Arrive Home" where you can set the lights to turn on as you walk in the door. If you have any questions about this product by O'PRO9, contact us by completing and submitting the form below. If you are looking for a specif part number, please include it with your message.